The Best Meditation Podcasts from thousands of Meditation Podcasts on the web using search and social metrics. Subscribe to these audio podcasts because they are actively working to educate, inspire, and empower their readers with frequent updates and high-quality episodes. Meditation Podcast newsletter is a comprehensive summary of the day's most important audio podcasts episodes from the best podcasters on the web, and delivered to your email inbox each morning. To subscribe, simply provide us with your email address. About Podcast Daily guided meditations to manage emotions. Explore a weekly theme focused on an emotion to help you manage stress triggers. About Podcast Visit America Meditating Radio with sister Jenna to listen about meditation. Facebook fans n/a. Twitter followers 12,122. Virginia, USA About Podcast Guided meditations are offered freely by Tara Brach, Ph.D, psychologist, author and teacher of meditation, emotional healing and spiritual awakening. Facebook fans 181,681. Twitter followers 58,624. About Podcast A daily meditation where listeners experience the Bible story and contemplate the meaning. Grow deeper by experiencing God Word. Facebook fans n/a. Twitter followers 114. About Podcast Shambhala Meditation Center of New York offers public meditation instruction, mindfulness training and Buddhist teachings to New Yorkers of all traditions. Facebook fans 13,024. Twitter followers 4,613. About Podcast Follow AMORC from time to time to listen about meditation. Facebook fans 312,438. Twitter followers 12,746. United States About Podcast Christian meditation podcast helps you to reduce anxiety and become more open to be changed by the Spirit of God and includes references to the biological basis for these changes as well. Facebook fans 163. Twitter followers 101. About Podcast About Meditation provides you with resources for your meditation, whether you want to relax, stimulate creativity, gain enlightenment or cultivate mindfulness and compassion. Facebook fans 102,118. Twitter followers 586. About Podcast Find Raghu Markus mindrolling podcast right here. The Be Here Now Network offers weekly doses of digestible Eastern philosophy from a range of spiritual teachers in the form of mindfulness podcasts. Facebook fans 30,272. Twitter followers 6,030. Puerto Vallarta, Jalisco About Podcast Natalie Perez is a yoga teacher who helps others make yoga plus meditation a part of their lives by bringing it into their homes. Join her on the meditation cushion for Roaming Yogi Meditations. Facebook fans 375. Twitter followers 90. About Podcast Meditation Minis host Hypnotherapist Chel Hamilton for mind-shifting mini meditations to calm your anxiety, overcome negative thinking, increase your confidence in 10 minutes or less. Facebook fans n/a. Twitter followers 509. Brooklyn, NY, USA About Podcast Scott Tusa is a Buddhist teacher based in Brooklyn, New York. He teaches meditation and Buddhist psychology nationally. Facebook fans n/a. Twitter followers 72. About Podcast Father Ian Van Heusen teaches about Christian meditation to lead all people to Christ. Facebook fans 3,583. Twitter followers 532. Facebook fans 211. Twitter followers n/a. About Podcast Fall asleep fast with guided sleep meditations by Tracks To Relax. This guided meditations will help you relax and fall asleep at bedtime. About Podcast Science of Mind Spiritual Center aims to make the world a better place spirit to spirit. Facebook fans 806. Twitter followers n/a. Facebook fans 1,001. Twitter followers 229. About Podcast The Rime Buddhist Center is a non-sectarian center dedicated to the cultivation of wisdom and compassion. The Center is a refuge for the nurturing of inner peace, kindness, community understanding and world peace. Facebook fans 3,671. Twitter followers n/a. About Podcast Follow Guided Meditation Podcast to begin a new day, create the space for peace, healing and transformation. Facebook fans 619. Twitter followers n/a. About Podcast Follow Step by Step to Inner Peace to learn more about meditation. Facebook fans 329. Twitter followers 23. Facebook fans 2,100. Twitter followers 2,010. Australia About Podcast Follow Little Rockers Radio to listen about kids meditation. Facebook fans 21,086. Twitter followers 297. UK About Podcast A series of simple mindfulness meditations which can be used at home and at work. Facebook fans 48. Twitter followers 258. About Podcast A discussion on meditation by teachers, scientists and religious leaders. About Podcast Follow Meditation podcast from Unity North Tampa to learn more about spiritual living. Facebook fans 532. Twitter followers n/a. 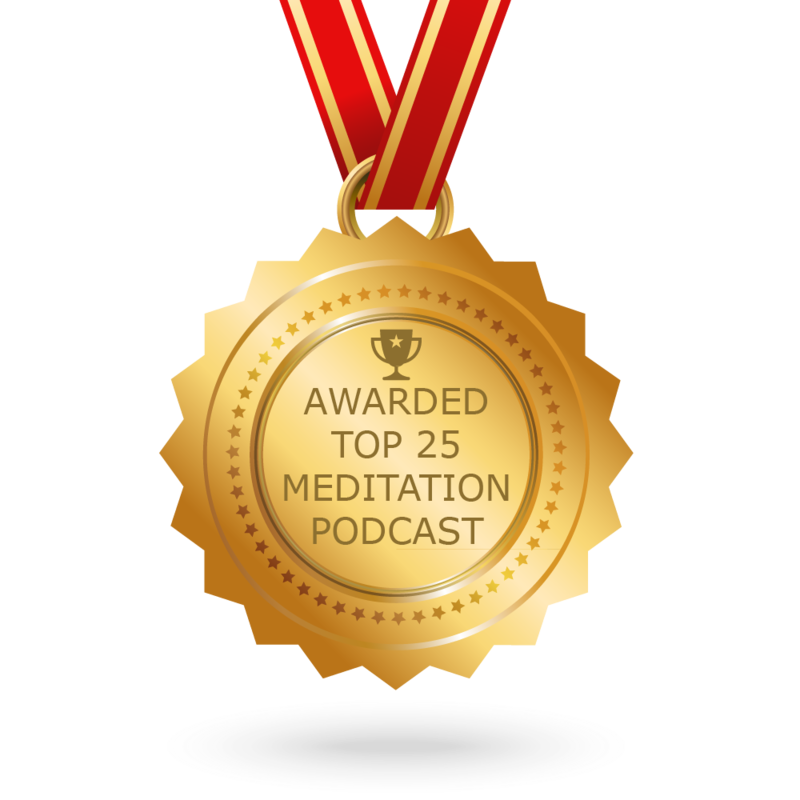 CONGRATULATIONS to every podcast that has made this Top Meditation Podcasts list! This is the most comprehensive list of best Meditation Podcasts on the internet and I’m honoured to have you as part of this! I personally give you a high-five and want to thank you for your contribution to this world.